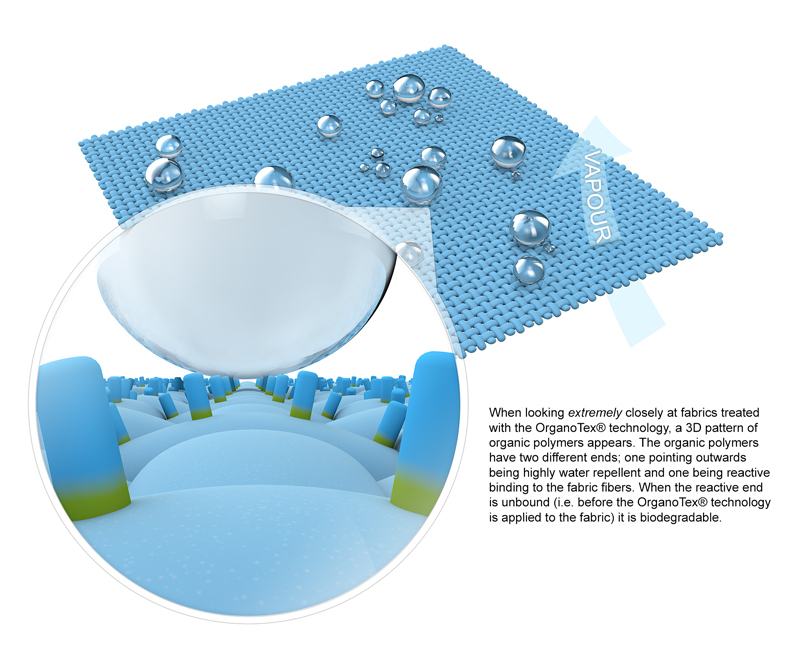 The “fatty” polymers are bound to the textile fibers through the organocatalysis, creating 3D-network of water repellent molecules around the fibers. The chemistry used is readily biodegradable according to the test OECD 301C and non-reacted chemistry released during production or during use of the fabric will degrade. However, the water repellent functions becomes durable when the polymers bind to the textile fibers. This is achieved thanks to the polymers structure. One end of the polymers are reactive and one is water repellent (hydrophobic). Before the OrganoTex® technology is applied to the fabric the reactive end of the polymer is unbound and the polymers are therefore biodegradable. However, in the presence of the unique plant-based catalysts, the reactive end binds the fabric fibers and is then rendered non-degradable and becomes highly durable. Below is an image, describing this unique feature.